KSB’s online Product Catalogue includes all specifications, data and literature. Find product literature and publications for every requirement. Eta and I – simply inseparable! Eta is part of our daily life, without us even realising it. Whether we're drinking coffee with sugar in it, spending time in an air-conditioned room or relaxing in a swimming pool, Eta is everywhere we go. This year we've shown you the many things that this KSB pump family does for us and why we are simply inseparable. Read about a day in the life with Eta. 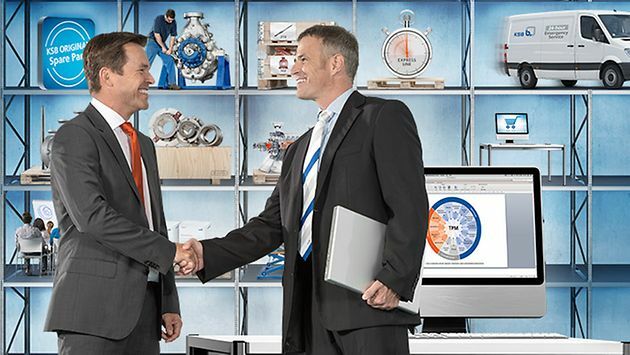 A real bespoke service: together with its customers, KSB develops tailored framework agreements ranging from single maintenance modules to a Total Pump Care package.